The WAND Sentiment Analysis Adapter is a part of the Social Media group of adapters that are managed by the WebFOCUS Reporting Server. 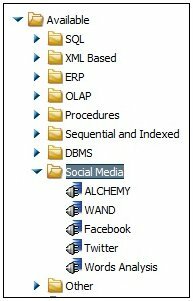 From the WebFOCUS Reporting Server Web Console or the Data Management Console, expand the Available folder and then the Social Media folder, as shown in the following image. Right-click the WAND node and select Configure, as shown in the following image. 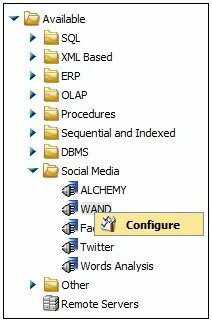 The Add WAND to Configuration pane opens, as shown in the following image. Enter a name to identify the connection (for example, WAND) in the Connection Name field. The Configure Adapters or Create Synonyms pane opens, as shown in the following image. Click Test to ensure that the WAND Sentiment Analysis Adapter is configured properly. The Testing Wand connection pane opens and displays the test results, as shown in the following image. 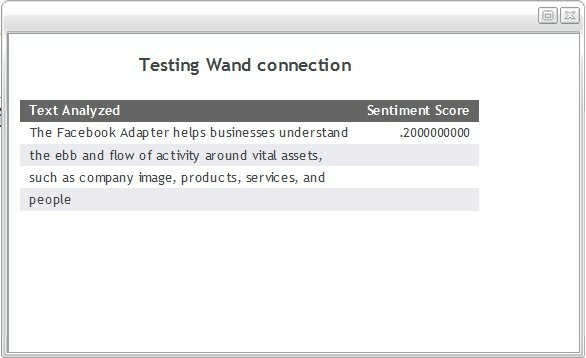 The following list describes the connection attributes for the WAND Sentiment Analysis Adapter. Port number on which the proxy server listens. The default port number is 80. Select a profile from the drop-down list to indicate the level of profile in which to store the connection attributes. The global profile, edasprof.prf, is the default.